Based on the Pulitzer prize-winning novel, THE ROAD is an epic adventure about a father and son’s quest for survival in a post-apocalyptic world. 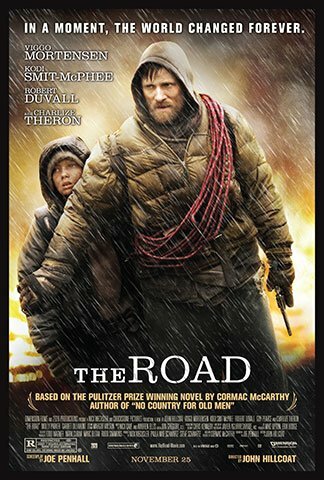 VIGGO MORTENSEN stars in the adaptation of last year’s acclaimed Pulitzer prize-winning novel, THE ROAD, by Cormac McCarthy. A man and a boy, father and son, walk a dangerous road in a post-apocalyptic world where cities have been destroyed, plants and animals have died and every scrap of food has been plundered. The few surviving humans who roam this wasteland have turned to cannibalism. This epic adventure follows the duo’s quest for survival as they make their way toward the sea in the hopes of finding safety and other surviving “good people.” The story explores hope in the face of hopelessness, the ephemeral nature of our existence and the vanishing worlds we all carry within us. As we watch these two travelers, a father and son who carry our humanity, we can’t help but feel the world hangs in the balance of their quest. Directed by JOHN HILLCOAT (THE PROPOSITION) and written by JOE PENHALL (ENDURING LOVE), the film is being produced by NICK WECHSLER (WE OWN THE NIGHT, NORTH COUNTRY), alongside STEVE SCHWARTZ and PAULA MAE SCHWARTZ. THE ROAD stars VIGGO MORTENSEN, recently nominated for an Oscar and Golden Globe for his performance in EASTERN PROMISES and the young Australian actor KODI MCPHEE (WOLVERINE) as his son. The Oscar-winning actress CHARLIZE THERON (IN THE VALLEY OF ELAH, MONSTER) leads the supporting cast together with GUY PEARCE (THE PROPOSITION, MEMENTO) and the Oscar-winning actor ROBERT DUVALL (THE GODFATHER, WE OWN THE NIGHT). Mr. Hillcoat re-teams with costume designer MARGOT WILSON, production designer CHRIS KENNEDY and JON GREGORY from THE PROPOSITION. Cinematographer JAVIAR AGUIRRESAROBE (TALK TO HER, THE OTHERS) is photographing the film. A 2929 Production, THE ROAD is executive-produced by TODD WAGNER, RUDD SIMMONS, MARK CUBAN and MARC BUTAN.